Well, I should say that I went in to this experience anti racing, but pro trainer. There is a bit of a back story. Condensed version… I posted about a health issue with my boy, and had three personal messages, all from trainers. One trainer in particular became very involved, and spotted an issue I hadn’t even realized. She brought my boy back to health. I realized then that the trainers DO care. This is what I saw, in as concise language as I can. We saw weigh in for schooling. We saw tattoo inspections, (the inspector gave lots of head scritches and gentle pats) and the lead outs gave lots of pets. We didn’t see any rough handling, and all the dogs looked great and very happy. All the dogs approached us at the fence to meet us while walking past, tails wagging. None were hand shy when petted. There were one or two that were shy, but not terribly so, and seemed to be comfortable with trainers. 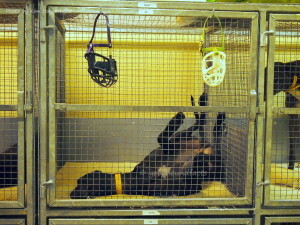 At schooling, we saw the dogs get dressed in their jackets and racing muzzles. They seemed to “lean into” the racing gear, (Which I want to thank the industry for. It makes Michigan winter dress up time so easy). They got walked down to the boxes. You can hear them rooing and barking to go. We learned about how the lure is run, and stopped (It needs perfect timing). I took lots of photos of the dogs running. We did see one tumble, after which the dog rebounded and ran the opposite way. The break operator yelled for that dog’s lead out and he/she was grabbed ASAP. When those dogs get to the lure (can’t remember the name) they get all silly, tails going crazy, jumping, barking (Reminds me of my Hammer when we get home). The lead outs grab the dogs. We did hear a little growling, but it was handled quickly by the lead outs; grabbed under the tuck and pulled dogs back to loosen the pack. Dogs are lead off and picked up by trainers. 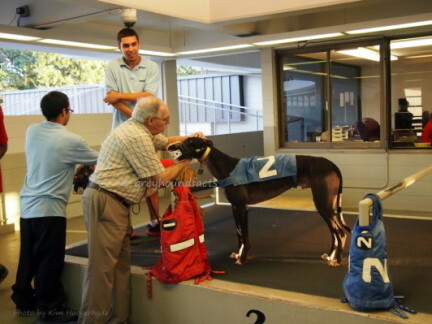 Greyhound Facts’ note: the lure at Derby Lane is called Harrison Hare. 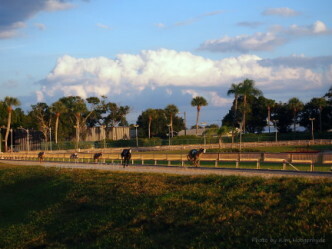 Trainers picked up their dogs after schooling, undressed and leashed them up. They walked to the cool off tank, which was awesome at Derby Lane. There’s a gentle ramp the dogs walk up to get into the water that is up to their mid back. 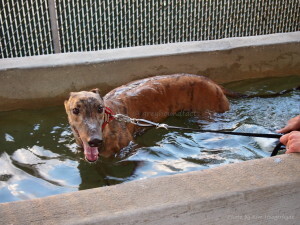 Trainers continued to bathe the dogs to cool them off, and ran their hands over them with water. After cooling them off, the dogs got loaded up and went back to the compound, which is right behind the track. To enter the compound, you need to have a pass which is then checked by security. The kennel was loud when we got there, but not bad. Actually, an exciting sound to a dog lover. The kennel was a comfortable temperature and had three turn out pens. The crates were bigger than the ones I have at home. (I need to apologize to my dogs for downsizing them). Each dog had two pieces of carpet. There was no odor in the kennel, and it was clean. Cleaner than I expected. I should note that there was no way they could have cleaned special for us, they didn’t know we were coming. 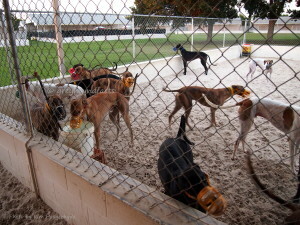 The trainer muzzled up the dogs and let half of them out to separate pens. The dogs all came up to us, very, very happy, and we received lots of muzzle kisses! The trainer had such a rhythm, it was smooth transition. She picked up poo and rotated the dogs from one pen to another. Then it was repeated for the second set of dogs. After turn out, they all relaxed in their crates. They laid down, stretched out. They were very comfortable. The trainer had three special dogs, two that were a bit spooky, and one who had a break. A gorgeous dog. The cast was incredibly clean. It was a good solid full cast. Better than the one my first boy got from our vet. These dogs went out by themselves, and all responded to the trainer favorably. I saw dogs give her kisses, hugs, follow her around with tails wagging, and watch her with those big loving Greyhound eyes. I was also amazed how easily some jumped into the top crates. Some put front paws up and got a back end boost. Some just looked at the trainer and got the full lift. The trainer gave lots of loves and handed out a few Milk bones to each dog. One dog sits and shakes! Adorable. The dogs that schooled or raced had food ready, mixed, kept in the fridge, and labeled for each dog. There were bags of meat thawing. It looked like good, chopped beef. It was fresh in color, with not too much fat. We saw some mix ins, but don’t want to give away secret recipes, so I will just say that it was name brand, some people food, and some surprised me. (Suffice to say, I understand my dog’s sweet tooth). There were prebiotics and vitamins, wound care supplies, and booboo healing stuff. The trainer wrote down the few instances where a dog moved different than normal, so it could be addressed with a rub down. These dogs are healthy! So healthy! Solid muscle, clean teeth, shiny coats. They were happy, loved on their trainer, and knew their names. She took interest in each dog, could tell us their nickname, their personality, and any quirks they had. As an aside, there is nothing better than being surrounded by so many happy licking faces! I also want to thank all trainers for what they do. It has to be exhausting. They work every day, regardless of holidays or late hours. I also want to thank them for setting a great base of training for adopters to build on. These dogs understood tone. When they get a little rowdy, a “knock it off” stops it. Just like at home. Both of my dogs understood “no” when they came to me. This is because of trainers. They also understood cookies and belly rubs, and how to get what they want with big loving eyes… because of trainers. So, thanks to all trainers for loving on our dogs before we can!